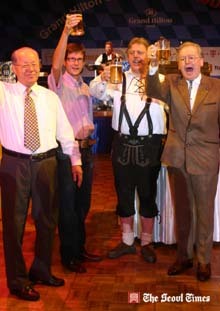 Mr. Brender (second from left) poses for the camera with Mr. Wang Sang-Eun, Lufthansa's CEO (to his right); Mr. Christian Schindler, Lufthansa's new general manager (far right); and Mr. Harald Hahn, Lufthansa's outgoing general manager at 2008 Oktoberfest held at Grand Hilton Hotel in Seoul on Sept. 5, 2008. "2008 Oktoberfest" held on September 5-6, 2008 at Grand Hilton Hotel in Seoul drew myriad of both local and international guests in spite of quite expensive prices including many local workers of German companies based in Seoul and their foreign co-workers, ordinary citizens, young couples, even the whole family members. They have one thing in common — lovers of beer. Authentic German beer was also available but with the extra cost. A wide selection of German dishes offered in a buffet style. German music by German performers added flavor to the second Oktoberfest, the largest German festival. 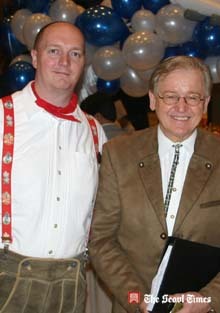 The German food was prepared by the German chefs including Mr. Erwin Graf, executive chef of the hotel. Mr. Brender (right) and other V.I.P.s making the toast for the Oktoberfest. This year's festival was sponsored Seoul office of Lufthansa German airlines, Deutch Telekom, OTTO, Asian Tiger, Davidoff, BMW and US Potato all German companies. The festival was held under the auspices of Grand Hilton Hotel, formerly Swiss Grand Hotel in Hongeun-dong, Seodaemun-gu, Seoul. 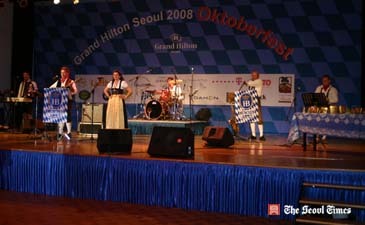 The Oktoberfest is gaining popularity in South Korea, as else where in the world. "Nearly all 1,200 tickets were all sold out this time," said hotel's PR manager, Ms. Myung Ji-Young. The whole festival was directed by Mr. Bernhard Brender, general manager of the hotel. Other organizers included Mr. Wang Sang-Eun, Lufthansa's CEO; Mr. Christian Schindler, Lufthansa's new general manager; and Mr. Harald Hahn, Lufthansa's outgoing general manager. They surprised the guests by appearing in a carriage drawn by a real donkey and a mule. Mr. Hahn was donning a traditional Bavarian costume. 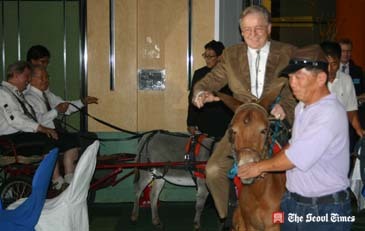 Mr. Brender riding the donkey at the 2008 Oktoberfest. The festival was emceed by Mr. Ashley Cheeseman, assistant director of hotel's Food & Beverage section. Mr. Cheeseman spoke impeccable Korean as well as English. Mr. Brender opened the festival with a short but impressive speech. 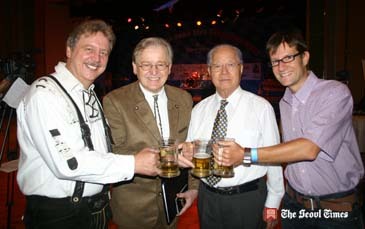 "It is an honor for me to introduce Oktoberfest to Korean people in Seoul," he said. "Oktoberfest is the festival of my fatherland." The festival was composed of performance by Erdinger, a German band from Munich, arm wrestling competition, hammering, and speed beer drinking. The program is just like the one in Germany, according to the PR manager. Lucky draws were an extra pleasure to the guests. Airline tickets and hotel accommodations were offered as parts of the gifts. Mr. Bernhard Brender (right), Grand Hilton's general manager, poses for the camera with Mr. Ashley Cheeseman, F&B director of the hotel. The Oktoberfest is a sixteen-day festival held each year in Munich, Bavaria, Germany during late September (and running to early October). It is one of the most famous events in the city and the world's largest fair, with some six million people attending every year, and is an important part of Bavarian culture. Other cities across the world also hold Oktoberfest celebrations, modeled after the Munich event. Oktoberfestbiers are the beers that have been served at the event in Munich since 1818, and are supplied by 6 breweries known as the Big Six: Spaten, Lowenbrau, Augustiner, Hofbrau, Paulaner and Hacker-Pschorr. Traditionally Oktoberfestbiers were the lagers of around 5.5 to 6% abv. called Marzen - brewed in March and allowed to ferment slowly during the summer months. Originally these would have been dark lagers, but from 1872 a strong March brewed version of an amber-red Vienna lager made by Josef Sedlmayr became the favourite Oktoberfestbier. Since the 1970s the type of beer served at the festival has been a pale lager between 5 and 6% abv. and the terms Oktoberfest and Marzen are used by non-Oktoberfest brewers in Germany and the USA to market pale lagers of this strength. The colour of these lagers may range from pale gold to deep amber, with the darker colours more common in the USA. Hop levels tend not to be distinctive, though some American examples may be firmly hopped. Ted Gim serves as staff reporter of The Seoul Times. He studied tourism management at a S. Korean university. He spent three years in England and Ireland, studying and living there. He studied tourism at an English college for two years. He covers tourism industry as well as diplomatic community in Seoul.